They share EVERYTHING...their toys, their clothes, their deepest fears, their sad days, their happy days, their secrets...that's what sisters do. In their room, Coraline and Amelie have a box where they keep all their belongings. It's a community box of sorts, filled with clothes and toys. There are pretty dresses to be exchanged, hats, head gear, tops, bottoms and shoes to mix and match and share. There are even favorites to be exchanged...their dolls, named Bebe and Bibi. They love to play dolly and they don't mind when one or the other changes hands. They like to dress their dolls up, even if the clothes are much too large for the dollies. It makes them feel like they are mamas and they like to pretend that they are. Coraline and Amelie are the best that sisters can be...always there for each other, always there with each other. Lucky are those who grow up with a sister. Coraline and Amelie are sister creations, inspired by real life sisters, the granddaughters of a sweet grandmother. Creating Coraline and Amelie gave me so much time to remember and think of my own sisters. Both sisters live equidistantly from me, each on the extreme ends of the states...one on the East coast and one on the Hawaiian islands. So, I suppose that I should feel blessed to be in between, where I can visit either without traveling more than 3000 miles. But, yet, I wished we all live closer than we do. Coraline and Amelie are Wee-Bee Mini Elfcup dolls. They both stand less than 6" (15 cm) tall. They are made with all natural materials. 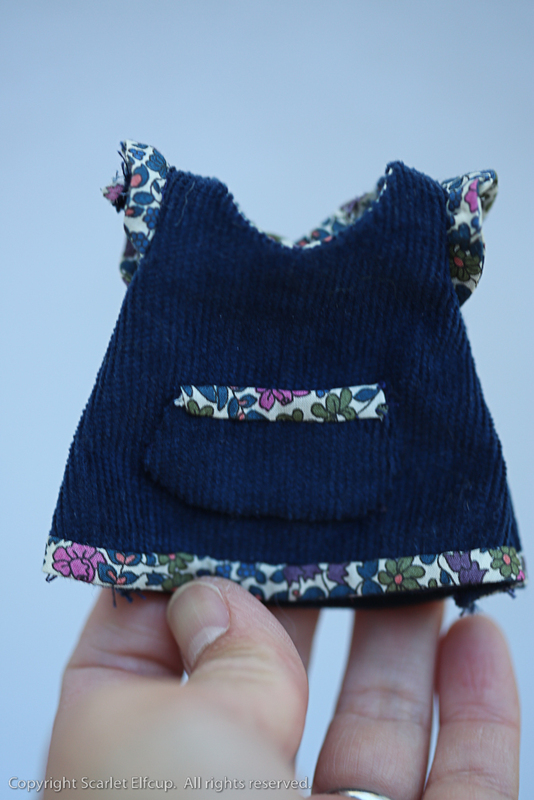 Their doll skins are made with premium quality cotton jersey made in the USA. They are firmly stuffed with bio-wool also made in the USA. Their seams are sewn twice for reinforcement. They have embroidered facial features. Their facial structures are sculpted giving each sister distinctive characteristics. Their cheeks, nose and various body parts are blushed with red beeswax. Their hair is 100% suri alpaca, wefted and then sewn into a crocheted wig. 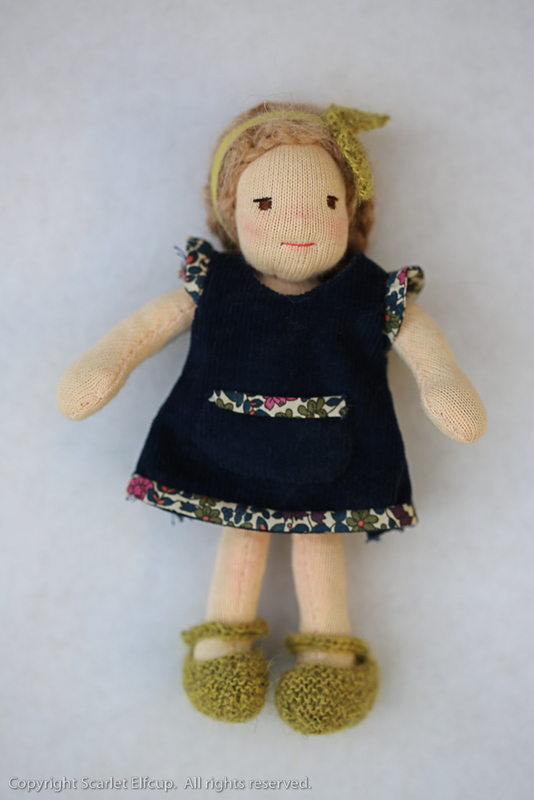 They are sitting dolls with sewn joints made flexible for changing of clothes. They also have belly buttons and bums. Both Coraline and Amelie come with two sets of outfits and a rag doll. 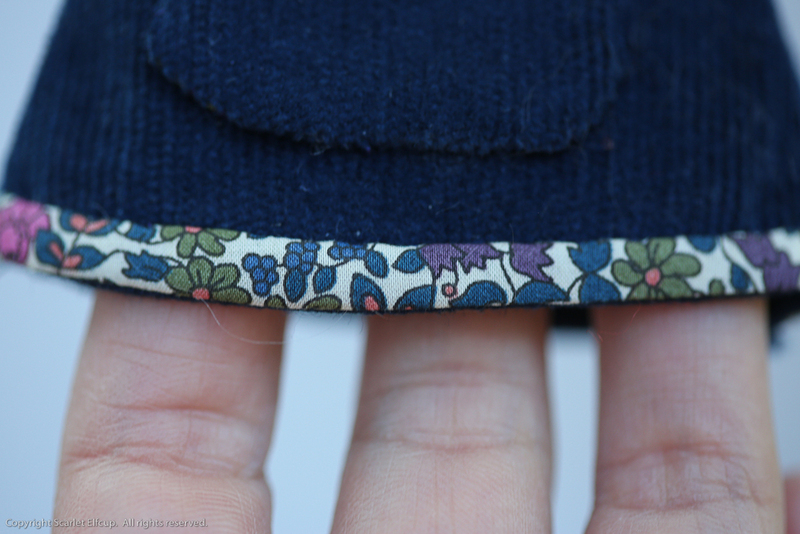 Coraline comes wearing a 100% cotton navy corduroy dress detailed with sprinkles of Liberty of London 100% cotton floral printed fabric. Her dress is faced at the neckline, hemmed, and ruffled on the capped sleeve with Liberty of London. A small pocket embellishes the front of the dress and is detailed with a dash of Liberty. Underneath, she wears white 100% cotton undies. Her head band is made of 100% cotton ribbon, decorated with a hand knitted bow made from 100% alpaca yarn, and fastened on the back by a nickel-plated snap button. 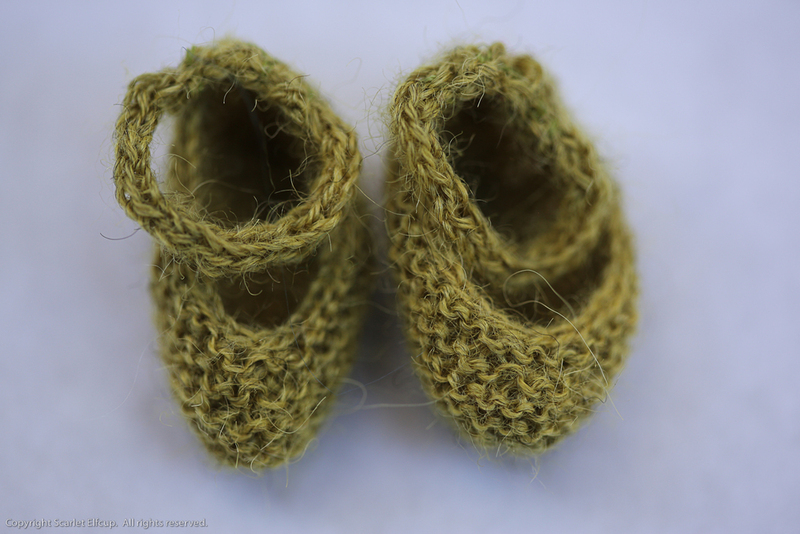 Her moss-colored Mary Janes are hand knit with a 100% fine alpaca yarn. She comes along with an extra change of clothes...a hat, knitted top and skirt. The hat is hand knit with 100% fine alpaca yarn. 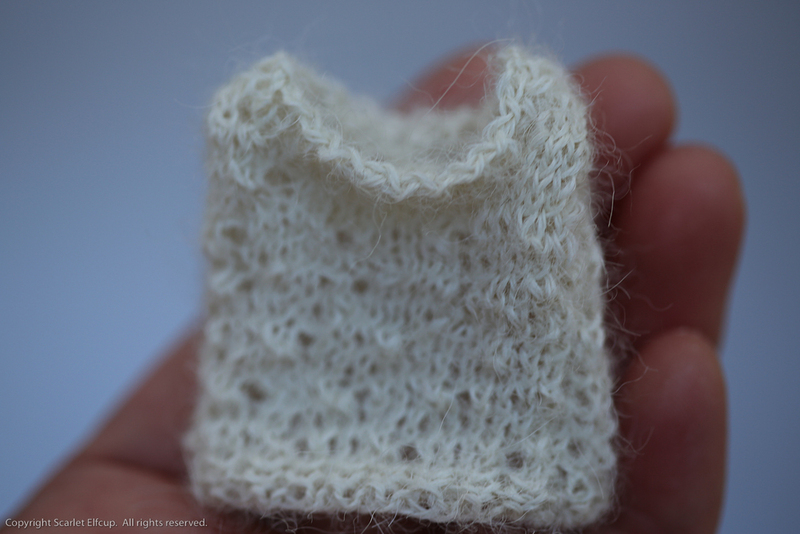 The top is hand knit with an eyelet pattern and is made of 100% fine alpaca yarn. Her skirt is made from 100% cotton, fastened at the back with a nickel-plated button. 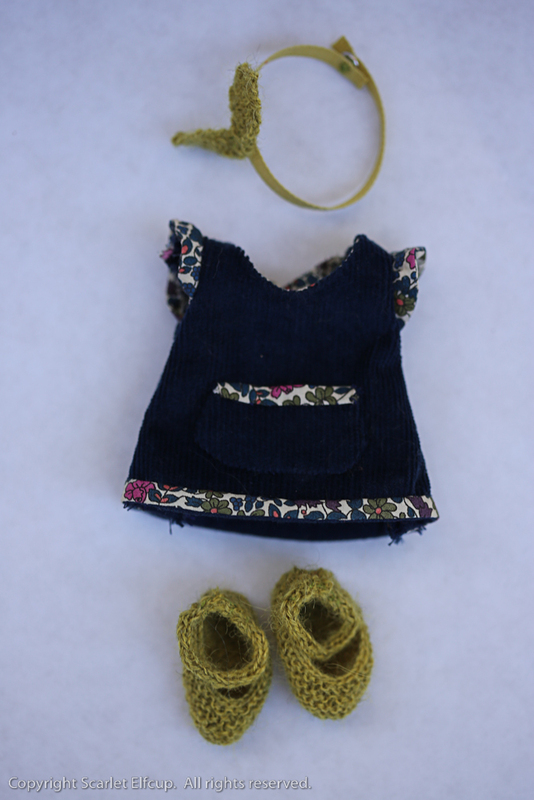 And her navy blue Mary Janes are hand knit from a 100% fine alpaca yarn. Coraline's rag doll, Bebe, is a itty-bitty doll who stands at a whopping 2 inches (5 cm) tall. 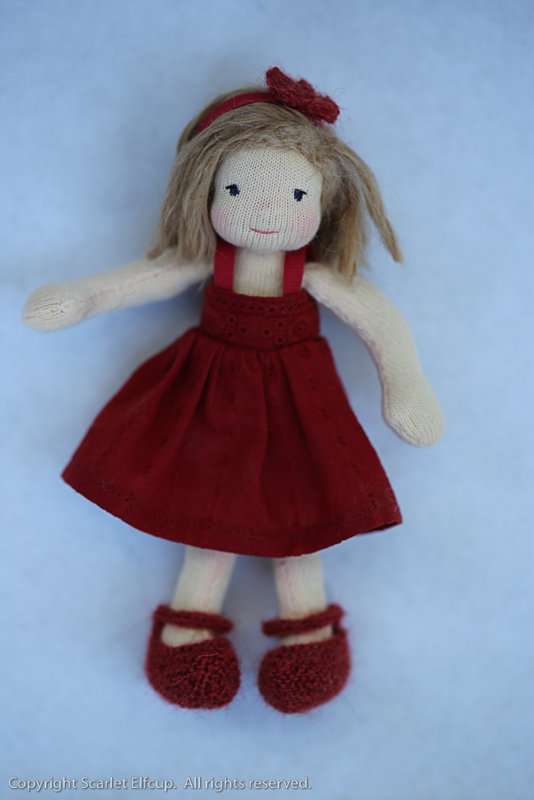 She and Amelie's doll, Bibi, are the smallest dolls ever made by Scarlet Elfcup. Bebe is made of 100% cotton muslin and stuffed with 100% clean carded wool made in the USA. Her face is embroidered with 100% cotton floss and her cheeks rosed with red bees wax. Her dress is made of Liberty of London 100% cotton fabric. Her hair is made from 100% cashmere, sewn directly to her head. Amelie comes wearing a 100% cotton scarlet dress detailed with a sweet lace pattern. The dress opens fully on the back with two nickel-plated snap buttons. Over the dress, is a hand knit cardigan made from 100% fine alpaca yarn and embellished with three tiny functional buttons. Underneath her dress, she wears white 100% cotton undies. 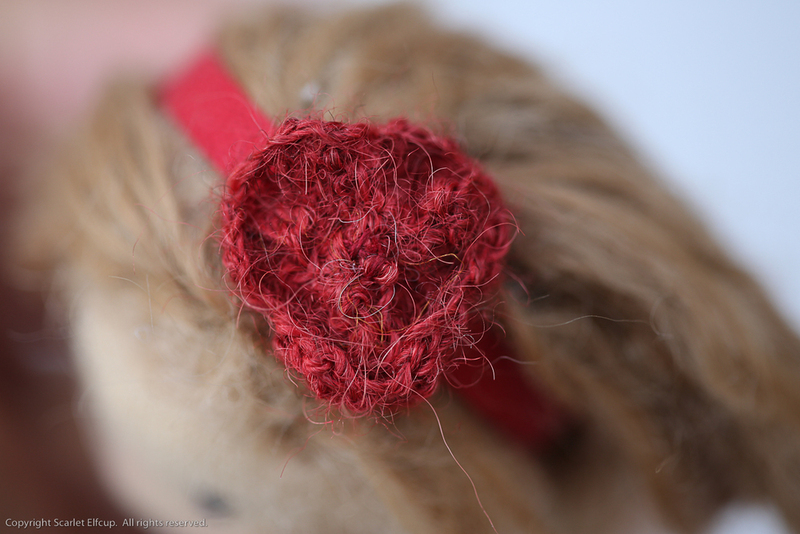 Her head band is made of 100% cotton ribbon, decorated with a hand knitted flower made from 100% alpaca yarn, and fastened on the back by a nickel-plated snap button. 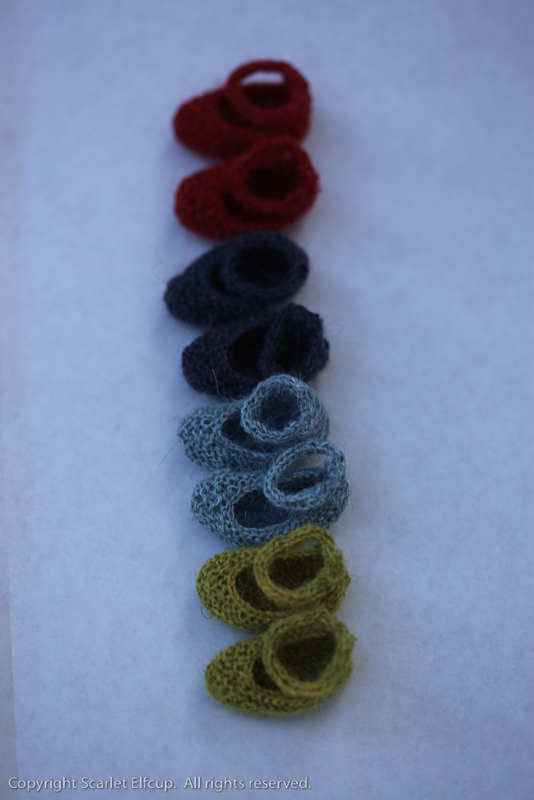 Her scarlet Mary Janes are hand knit with a 100% fine alpaca yarn. Amelie also comes along with an extra change of clothes...a beret, knitted top and summer shorts. The beret is hand knit with 100% fine alpaca yarn and embellished with a knitted tie fed through eyelets. The top is made of 100% cotton linen and decorated at the sleeve with 100% cotton lace. Her cute polka-dotted shorts are made from 100% cotton knit. 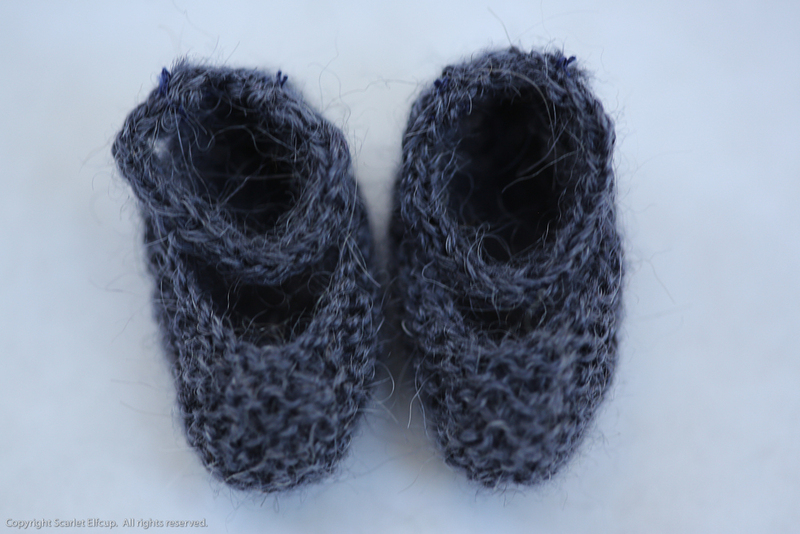 And her blue Mary Janes are hand knit from a 100% fine alpaca yarn. 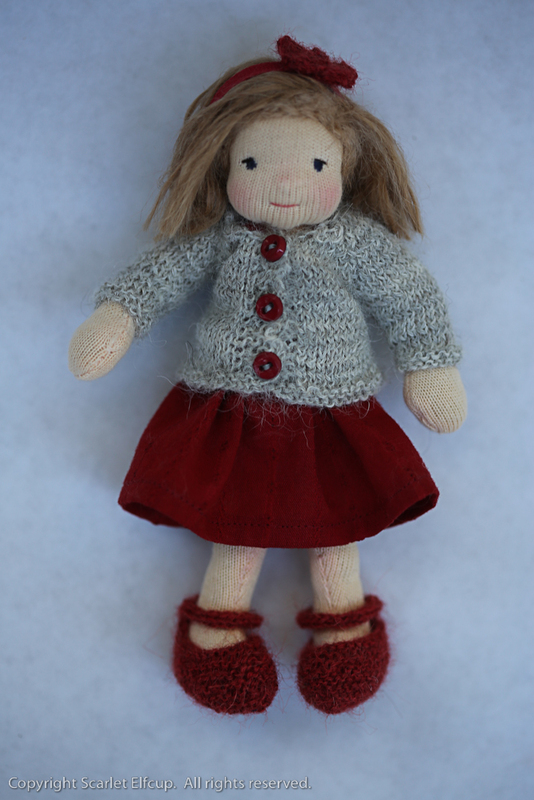 Amelie's rag doll, Bibi, is a itty-bitty doll who stands at a whopping 2 inches (5 cm) tall. Bibi is made of 100% cotton muslin and stuffed with 100% clean carded wool made in the USA. Her face is embroidered with 100% cotton floss and her cheeks rosed with red bees wax. Her dress is made of 100% cotton fabric. Her hair is made from mohair yarn, sewn directly to her head and capped with a night hood made of 100% cashmere. 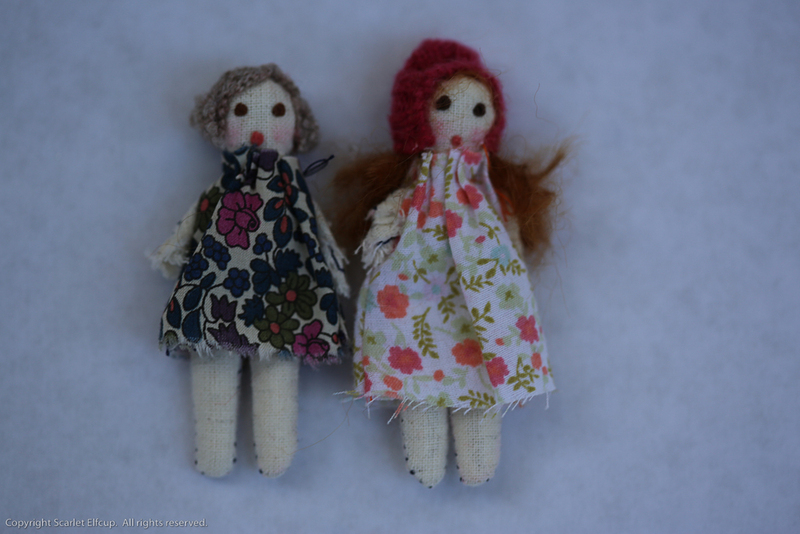 Coraline and Amelie...sister dolls made for a dear grandmother and her sweet granddaughters.